This overturned truck blocked the Back Hannawa Road Wednesday, forcing a section of the road to be closed by police. North Country Now photo by Bill Shumway. POTSDAM – The driver of a tractor-trailer that overturned in the middle of the Back Hannawa Road was ticketed for unsafe speed and failure to maintain a lane, according to state police. Part of county Route 59, also known as the Back Hannawa Road, was closed for nearly five hours Wednesday because a 2000 International Harvester, owned by TNT Trucking of Norfolk, lost control and overturned. The truck was hauling 33 tons of road salt and was being driven by Dennis R. Wright, 58, Canton, troopers said. He was ticketed for the above driving infractions. 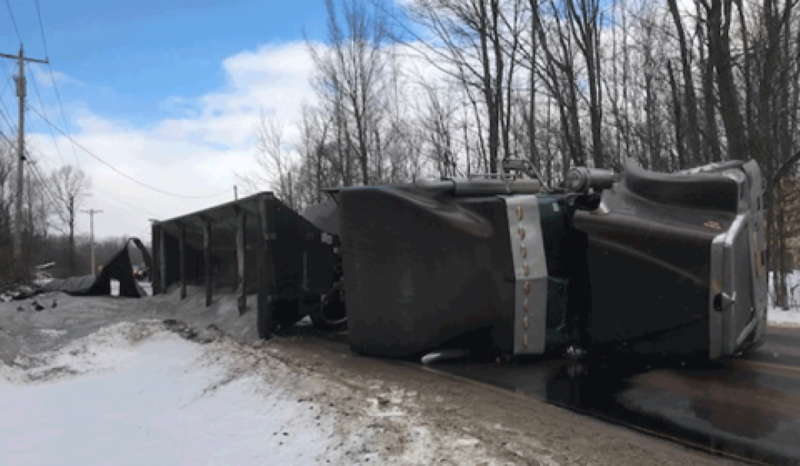 The incident occurred around 1 p.m. and St. Lawrence County sheriff's deputies announced the road was reopened at 6:07 p.m.
After the truck overturned, state police redirected southbound traffic onto the South Canton Road. The load of salt poured out of the truck onto the side of the road just south of the intersection. The area is marshy and a turtle nesting ground. The state Department of Environmental Conservation responded to the scene to clean up the salt spill. The Potsdam Volunteer Fire Department also responded as liquid had poured out of the engine. Route 11 Trucking responded to tow the vehicle, troopers said.